Two days after my arrival in England, Sebastian and I embarked on an adventure to the West country. That morning, Sebastian woke me around 5 a.m., which nearly deterred me from going on the trip at all (it's sacrilegious to get up that early). Jet-lagged and almost nearly comatose, I managed to drag myself out of bed, mostly because a surprise had been promised. Nothing like anticipation to get you up in the morning (or coffee... there may have been some of that involved)! For the past few days I had been desperately trying to extract clues out of Sebastian, but, damn, that guy is pretty good at keeping a secret. We had been driving in the dark for a few hours, and just as the sun started to spill over the horizon, I caught glimpse of a very familiar structure - a circular cluster of upright stones silhouetted in the distance. "STONEHENGE!" My jet-lag faded. Now I was giddy -- really giddy, like I'm-about-to meet-a-celebrity giddy. So this is the surprise, I thought. Well, almost. If you know about Stonehenge, you can't really go inside the circle anymore. For preservation purposes, there are ropes keeping you a good distance away. As we drove into the practically deserted parking lot, the surprise was revealed. Sebastian had gotten special permission to go inside the monument. "Really?!" My jaw dropped. Really. 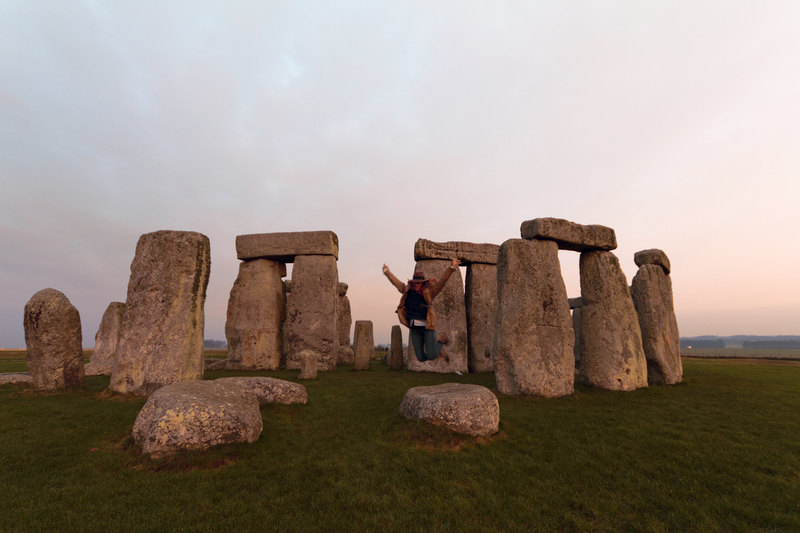 What an incredible experience - seeing Stonehenge up close at dawn! And we were basically alone, aside from a security guard, who acted mostly as a tour guide anyhow. He pointed out the earliest prehistoric graffiti, a primitive carving of a dagger. That kind of arcane stuff really fascinates me. When he wasn't looking, we did manage to touch the stones. For me, that was probably the best part. Being somewhat of a druidophile (yes, I may have just made that word up), that instant in time was pretty magical. While the true purpose of Stonehenge has been lost with time, some have said that it was a place of healing. In my last entry, I discussed the feelings of unrest that instigated this whole trip. Since I've been here, and especially after Stonehenge, I've felt more at peace. I feel good about where I'm going.